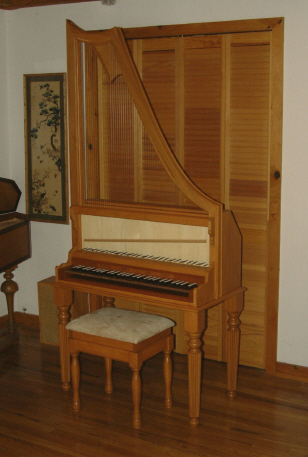 78" long, 36" wide, compass: GG-d3, transposing: A415/440, 2x8', all brass stringing, pedal board clavicytherium is 34" wide, 83" tall, 14" deep, compass C-d', not transposing, 2x8', all brass stringing, music desk and padded covers for cases, pedal board and stand. 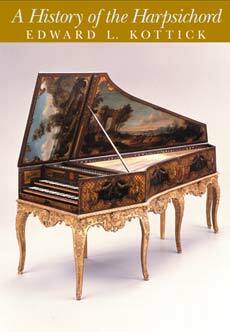 Available individually: German single with 3 screw-in legs and bottom apron (not shown): $15,000. Pedal board clavicytherium with trestle stand and bench: $15,000. 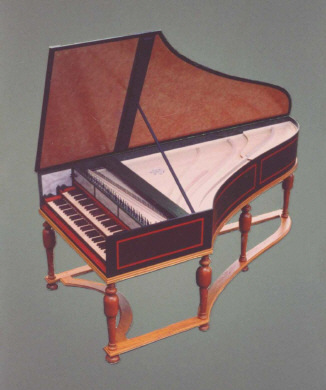 Upright open lyre with synthetic gut strings, 36" wide, 19" deep, stands 81" tall, 58" transport length, weight: 66 pounds, compass: GG-d3, not transposing, 1x8, casein tortoiseshell & casein ivory keys, music rack, 4 turned legs, bench. Made in 2001 and in excellent condition. 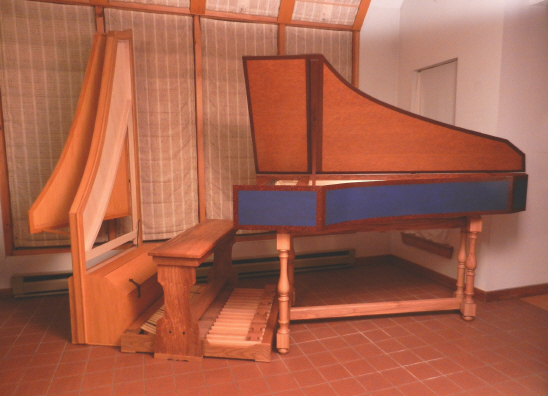 83" long, 40" wide, compass: FF-g3, transposing: A392/415/440, 4 choirs of lute strings: Lower manual: 1x8', 1x4'(top half only), Upper manual: 1x8', 1x16'(lowest two octaves at 8' pitch), buff stop, harfenzuge stop, French shove coupler, plastic jacks, bird's-eye maple keytops, music desk and padded cover. 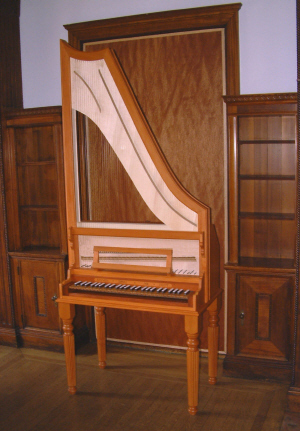 Semi-open lyre with soundboard on top, synthetic gut strings, 35" wide, 21" deep, stands 7'2" tall, 5'3" transport length, weight without legs: 82 lbs, compass: AA-d3 (54 notes, BB tuned to GG) 6.25" octave span, Brown Mallee burl key naturals with casein ivory sharp tops, not transposing, 1x8', music rack and matching bench.